MOSCOW, August 30. /TASS/. Russia will hold drills in the Mediterranean Sea on September 1-8 with the involvement of 25 warships and 30 aircraft, the Defense Ministry reported on Thursday. “In accordance with the training plan of the Russian Armed Forces, large-scale drills of the grouping of forces (troops) of the Russian Navy and the Aerospace Force will be conducted on September 1-8, 2018 in the Mediterranean Sea under the direction of Navy Commander-in-Chief Admiral Vladimir Korolyov,” the ministry said. 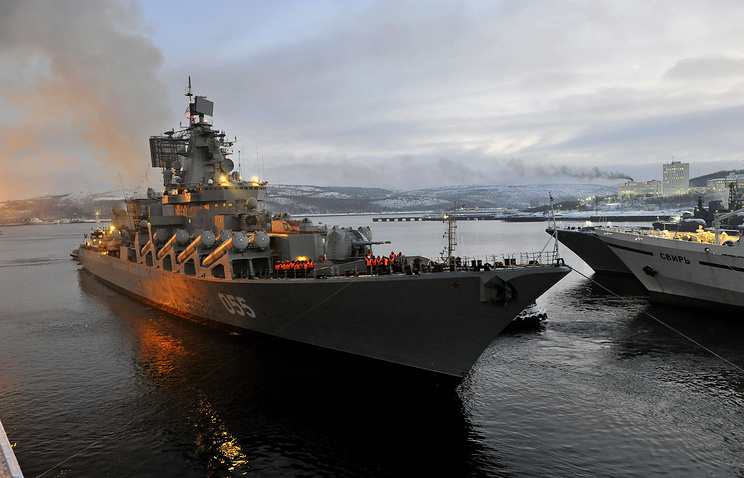 The Mediterranean drills will involve warships of the Northern, Baltic and Black Sea Fleets and the Caspian Flotilla and the aircraft of long-range, military transport and naval aviation, the ministry said. During the drills in the Mediterranean Sea, there are plans “to deploy a grouping of over 25 warships and support vessels led by the missile cruiser Marshal Ustinov,” the ministry said. “In the international airspace, training tasks will be practiced by about 30 aircraft, including the strategic Tu-160 missile-carrying bombers, the Tu-142MK and Il-38 anti-submarine warfare planes, Su-33 fighter jets and Su-30SM aircraft of naval aviation,” the ministry said. In accordance with the plan of the drills in the Mediterranean Sea,” the grouping will practice a set of tasks of air defense, anti-submarine and anti-sabotage warfare and also mine counter-measures support,” the ministry noted. For the purpose of ensuring the safety of shipping and flights, the areas covered by the drills will be declared dangerous for navigation and flights in advance, in accordance with international legislation, the Russian Defense Ministry said. Hey Buddy!, I found this information for you: "Russia to hold Mediterranean drills involving 25 warships and 30 aircraft". Here is the website link: https://russophile.org/russia-to-hold-mediterranean-drills-involving-25-warships-and-30-aircraft/. Thank you.